Last week, my eldest daughter asked me questions about Super Typhoon Yolanda. She told me she knew that Super Typhoon Yolanda devastated many towns in the Visayas Region and lots of families don’t have houses to go home to or livelihood to start over again. Then, she asked me “What about their Christmas?” She wants to give some of her toys to the kids as a Christmas gift to them like Santa Clause. You see, children have the immense capacity to give love. They may still be young but they want to help even in their small way. It’s never too early to start teaching our children to be compassionate to others. 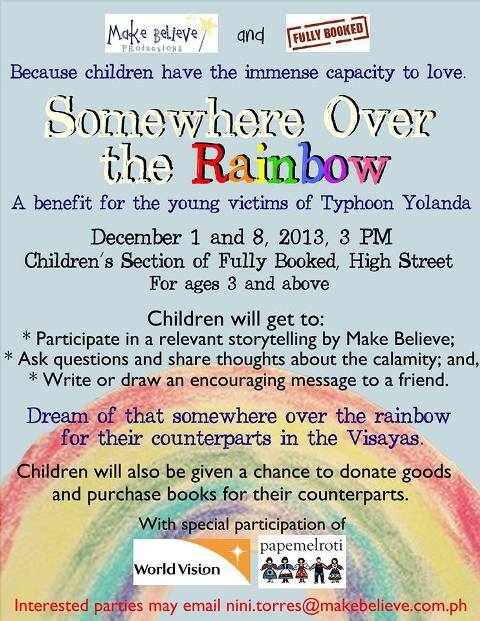 On December 1 and 8, 2013, Make Believe Productions together with Fully Booked will be having their event called “Somewhere Over the Rainbow” – a benefit especially designed for children in Manila to take part in relief efforts and express love and compassion for their young counterparts in the Visayas region, affected by Typhoon Yolanda. Our children can participate in their fun activities – interactive story telling by the Make Believe storytellers, A short discussion and sharing on the calamity and writing of letters and drawing of pictures to cheer up a friend. To make the event more special, child actress and host Hiyasmin Neri will be there on December 1 and Mike Shimamoto from Where’s the Sheep will be there on December 8. Participants may bring donations in the form of clothing, blankets, easy to open canned goods, shoes, slippers, toys, and books. Children will also be given the opportunity to purchase books to include in their donations. Donations in kind will be turned over to the Villamor Relief Operations and ABS-CBN Foundation. Cash donations will also be accepted and turned over to World Vision Philippines. Somewhere Over the Rainbow will be held on December 1 and 8, 3:00 p.m., at the Children’s Section of Fully Booked Bonifacio High Street. Please see the attached poster for more details. We hope you and your little ones can join us and spread the message! this is such a wonderful event! good luck..for sure the kids will be very happy for this! Sounds like a great event. I’ll see if we can go. Thanks for sharing. What a nice gesture of your daughter. Keep it up! This sounds like a fun event to attend to. It’s such a kind and altruistic gesture of your daughter to offer her toys to the young victims of the Typhoon Yolanda. It warms my heart how little kids can give so much love without asking anything in return. 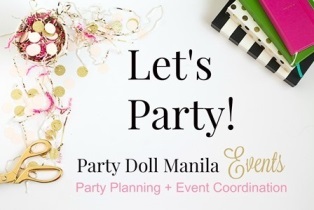 This is a very good event sponsored by Make Believe Foundation and Fully Booked. If I was in the Philippines right now, I will take my nephews and nieces to that event. You have a compassionate daughter. this sort of events are the kind i would like for me + my little man to participate. i will be sure to bring him to one of these when he gets a bit older. I believe kids are indeed full of love and so many in Youtube showed their heartache after what happened to Yolanda. This event is really something that will help the many who are in help at the same time will bring fun to children <3 Thanks for sharing! If I know anyone who can go I'll tell them about this! Sounds like a great event. Hope we can go!